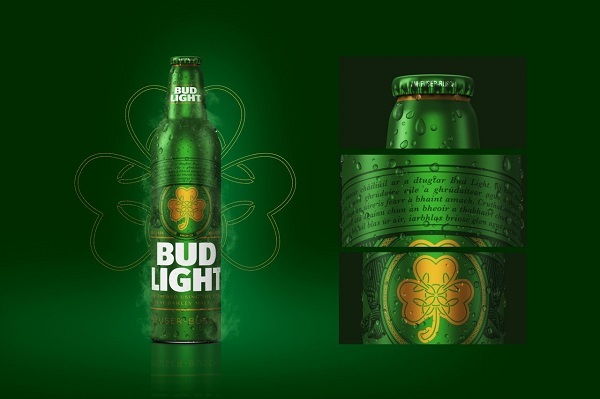 Beer brand Bud Light went festive with a limited edition bottle design for St Patrick’s Day this year. The company teamed up with FCB/RED, a retail division of marketing agency FCB Chicago, to create a bottle that reflects Ireland’s rich history and its traditions. In place of its classic banner, Bud Light’s special packaging displays translated Gaelic, in addition to a three-leafed shamrock on top of its branding. The bottle is dressed in green, which is inspired by the color of grass in the Killarney Hills of Ireland, and, of course, the hallmark hue of St Patrick’s Day. Take a look at the design below. Everyone: What is Bud Light doing for St. Patrick’s Day?